Naturally, the area itself should be safe. In this aspect, common sense goes far. Avoid plants and items toxic to your pets, and keep it neat and clean, so there aren’t sharp or dangerous objects lying around. If your pet enjoys digging, you might not want to have your favorite plants in the pet’s area. If you have a pool, it’s a good idea to make sure your pet doesn’t have access to it on their own. Even breeds who are great swimmers can get in and forget how to get back out, and some breeds can only swim with great difficulty. Bulldogs, for example, should never be left by a pool unsupervised. They may be able to splash around and keep themselves afloat for a few minutes, but they can’t swim for long. Next thing to consider is, the fence to your yard must be sufficient to keep your pets in your yard. 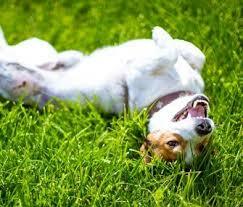 Most dogs will go outside, enjoy the sunshine and the grass, and go back in. They don’t need a serious fence to stay where they’re supposed to. Some dogs will dig and try to get under the fence. In these cases, you may need a wire fencing laid down against the base of your regular fence, bent in a L-shape. It can be buried, but many just put it on the grass and put some rocks on it to hold it down. With grass growing through it, you barely see it’s there. Some dogs will climb or jump. Make sure your fence is tall enough. If you have a jumper, dense shrubs along the fence line will force the dog to back up and jump longer to get over – which in turn makes the jump more difficult. There are also “rollers” designed to make it impossible to get a grip on the top of the fence – the roll spins. Some dog owners make this themselves from PVC pipe. 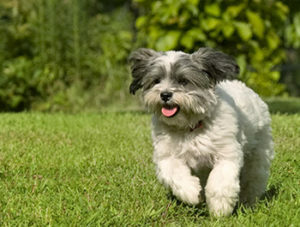 Landscaping can also help create a buffer between a “patrolling” dog and the outside world, helping your pet relax. If your dog is a K9 Houdini, there are enclosed, expanded exercise areas that basically puts a ceiling on the yard.